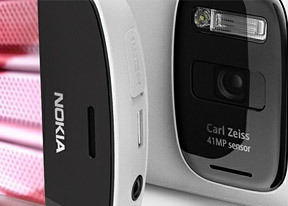 The Nokia 808 PureView is quite a social gadget. The dedicated Social app is the hub for all things social - with support for the two most popular networks, Facebook and Twitter. You can have multiple accounts on each network but only one of each can be active at a time. The Facebook section offers a wide range of options with an easy to use, touch-optimized user interface. Posting a status update is as simple as attaching a photo or video (or shooting one on the spot) as well as adding geotagging data. Twitter is accessed via a similarly neat interface. There's a handy button to shorten links and you can attach photos and videos to your tweets as well. The text input field for status updates for both Facebook and Twitter covers only the top half of the screen and the portrait QWERTY fits at the bottom. A cool feature is the All Activity section that becomes available when you add both Facebook and Twitter accounts. It pulls status updates from both networks into a single list. You can also post a status update on both networks simultaneously from there. Unfortunately, there's no option to post only to one of the networks - you have to go to the network's specific section to do that. Symbian is rapidly losing its market share and that can't be good news for its application store, which even in the prime of the platform remained pretty barren compared to the iOS App Store and Android's Play Store. The company has refreshed their Nokia store interface to make it more user-friendly for Symbian^3 and it's what you get on Belle too. And while the UI is indeed very handy to use, the number of apps is somewhat of a letdown. The default screen shows a list of featured apps or you can browse the apps available in the Nokia Store by categories (Applications, Games, Audio and Video content, Personalization) or by collections. Your account profile keeps track of all the apps you have installed under My stuff. You can now also select where games and apps should be installed and where audio and video should go. The Nokia 808 PureView comes with a built-in GPS receiver, which locked onto satellites in less than a minute upon a cold start (A-GPS turned off). Keeping the lock from then on was not an issue for the 808 PureView even in a dense urban environment. One of the best perks of buying a Nokia smartphone is that you get free voice-guided navigation for life (that's the phone's life, not yours). The voice guidance is currently available in over 70 countries and over 40 different languages, with even traffic information for more than 10 of those. In addition, Nokia did a pretty decent job of the Nokia Maps application itself, giving it a cool, touch-friendly interface, as well as nice features such as location info from Lonely Planet or Qype (you get a different source for the different locations). With Nokia Maps 3.09 you get three different view modes including satellite and terrain maps. Those however do need an internet connection. The more regular 2D and 3D view modes are also at hand and can be used with preloaded maps. You can download maps directly on the phone, no computer needed anymore. Nokia Maps is also usable for pedestrian navigation or you can switch the GPS receiver off and use the phone as a hand-held map. Nokia Maps 3.09 also joins in on the location check-in craze and supports a long list of networks (but not Foursquare, understandably). What's missing is the "More" option we've seen on other installations of Nokia Maps 3.06 - it allowed you to enable extra features like a 5-day weather forecast and Map Reported, which can be used to report map inaccuracies. Another perk is the Public Transport app which uses the GPS to show you the different means of public transportation near you (bus, subway, etc.). Currently, only big metropolitan areas are covered, but Nokia are assuring they are adding new locations every day.